BL(3D) touch woes... Any ideas? Also I'm typing on my mobile so apologies for any typos or dodgy auto corrects. I have looked for shorts and can't seem to find any, and my crimps I think are good. Are my issues down to having a clone? Or a setting? Or software? Is this a known bug? I'm using mode 9 and on one of the latest release candidates. Not sure what one off the top of my head... Maybe latest. A hump near the middle of the X axis can be caused by the X rail sagging slightly due to the weight of the carriage on it. what i did in the end is build a BFPTouch from thingiverse. It uses an optical endstop and is far more accurate. Marlins M48 gave me a SD of 0.002. It is not susceptible to heating being on compared to the bltouch. As for the hump... Yeah maybe the gantry is sagging not sure what to do about it. I honestly thought 2 10mm hardened steel with spaced out bearings would stop any sag like that.... Any ideas there? @mangy_dog well, that's also what the mesh bed compensation is there to some extent. 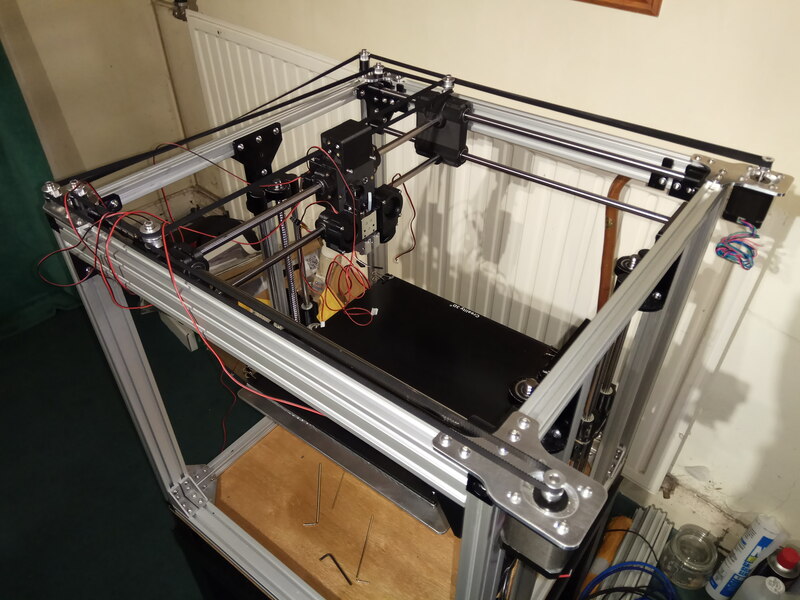 Once you have the BL touch working repeatability then try the printer with the compensation. Have you tried printing a first layer calibration print to see if the bulge is actually there or not? If you print that scaled to your bed size first without compensation active, and then again with it on you should be able to tell if the heightmap is correct or not. Approximately how much does the gantry weigh? Including the bearings, the carriage, hotend, etc. excluding the rails? @bot I don't know, but It has 2 mini turbo fans, 4030 I think... A chimera with volcano blocks. A small but not pancake stepper for direct drive extrusion, a titan like setup (custom design) and the BL touch. 4 ln10uu ball bearings and a slightly wide design thanks to the fans layout. All printed in cf petg. Honestly wouldn't have thought that be enough to make the gantry sag. The span is 500mm..... Maybe that is just enough to make this sag. @mangy_dog Sometimes the sag can also be a result of the rods getting bent during a head crash. Stack two of these on top of each other, and I could understand the displacement you're seeing in reality. Have you done a test print with mesh compensation active? It should have no problem taking care of the distortion. From the mesh image it looks like it's bowing UP not down. What do you have on top of the cast aluminum bed? My guess is your bed sheet is flexed either from the binder clips or from natural flex when it's heated and being held at the corners. Truth be told though I wouldn't worry about it. 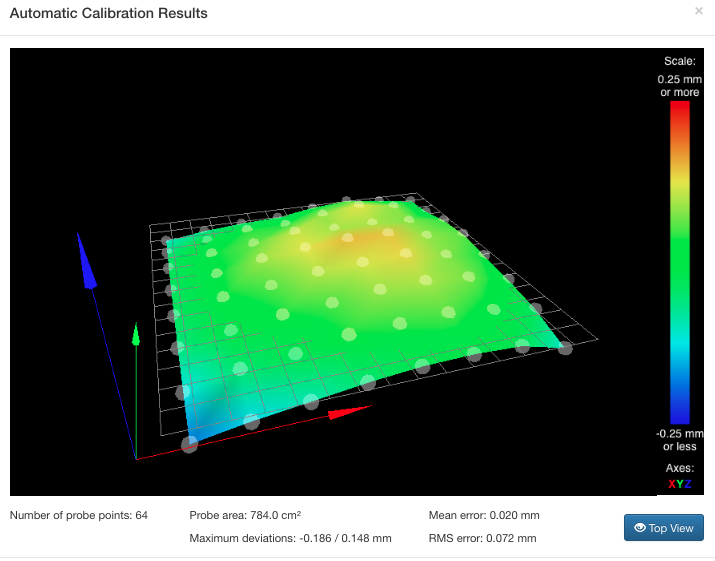 The bed mesh will compensate for that and your mean error is < 0.1mm. I wish mine was that close. I am also having the same issue that the probe doesn't always deploy when doing a G30 S-1. Mine does complete a bed mesh with no issues though. I would have expected a more "cylindrical" shape of the probing result, though. Edit: As it seems to be a CoreXY, there would be bowing on the X and on the Y axis, which explains the result. Could always take the bed sheet off and probe the aluminum directly and see what you get. Yeah its core xy, and the rods are alined vertically, with a 6cm space and 6cm separation of 4 bearings, I has thought that the spread load would negate downward stress.